Wand Walker - A Pressure Washer [Wand Walker - A Pressure Washer] - $29.95 : NewDaVincis.com!, Great Innovative Products, Gadgets and more. 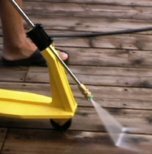 Revolutionary accessory makesÂ precision power washingÂ a breeze! The Wand Walker is an accessory for pressure washers that connects to the power washer hose system.Â The sprayer wand from the pressure washer is locked into place on a three-wheeled trolley that rolls along on any flat surface.Â This unit is portable, light weight, durable and adjustable.Â The Wand Walker ensures precision power washing and prevents furring on wood surfaces. The adjustable wand height makes it easy to get into corners, edges, and tight spots, eliminating the need for a swivel wheel.Â The ergonomic design eliminates fatigue.Â The fixed position front wheel maintains a straight line while washing. Power washers use water from a hose and increase the pressure as it leaves the wand at 2200-3500 psi or roughly 60 times the original pressure.Â While this allows for tough cleaning jobs to be done quickly, holding onto the wand for any length of time is cumbersome and tiring. The biggest problems encountered using just a power washer were damaging the wood surface, maintaing proper distance to the surface, fatigue, and portability. Â Adjustable height holds wand at a precise distance from cleaning surface. Â Perfect, consistent pressure throughout your cleaning project. 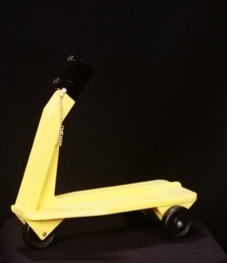 Â Ergonomic design eliminates fatigue. Â Gets into corners, right up to edges and intoÂ Â tight spots. Â Fits all 1/2? or 3/4? diameter wands. Â Works for cleaning OR stripping. Â Corrosion and chemical resistant. Â Prevents furring and gouging on wood surfaces.